Floor joist drying shrinkage most often occurs in new buildings causing the wall/ledge joint to expand as the bath or shower tray ledge drops down with the level of the floor. Deflection in baths and shower trays can occur under the imposed load of water and occupant. Acrylic baths on metal legs often deflect causing the wall/ledge joint to expand. Floor joist weight settlement can occur under the imposed load of an occupied bath causing wall/ledge joint expansion. Timber stud partition drying shrinkage and normal structural adjustment in new buildings can create hairline cracks at wall junctions and passages for moisture ingress. Cement based tile grouts are water resistant – not waterproof, and tiled partitions are not totally rigid. 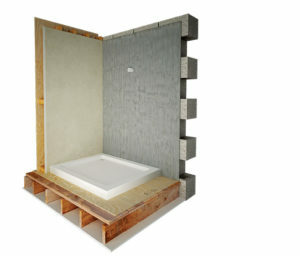 In such hi-use hi-performance shower environments with limited drying times, moisture contact with wall substrates is an eventual probability. Water sensitive backgrounds such as plasterboard and plywood absorb moisture and loose material integrity. This causes a reduced or loss of adhesion between the tiles and wall followed by an accelerated general installation failure. Seal the ledge/wall perimeter joints and tank the shower walls. 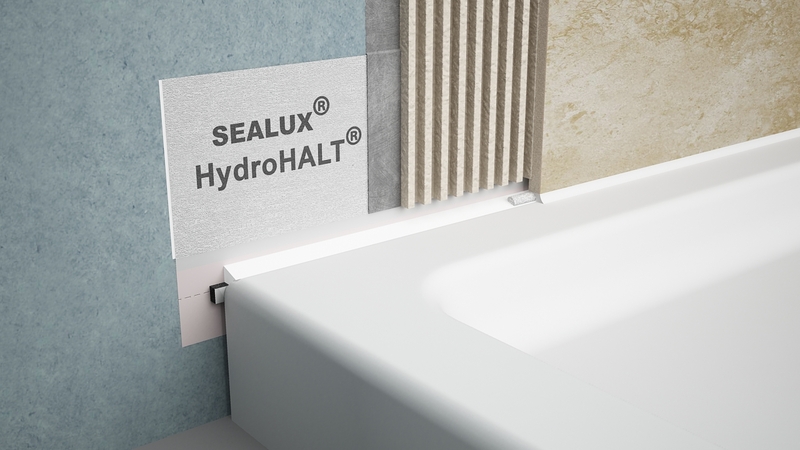 Sealux HydroHALT is our ‘state of art’ upstand sealing system. HydroHALT may be installed before, during or after installation of shower trays and baths and is compatible with liquid and mat waterproofing systems. 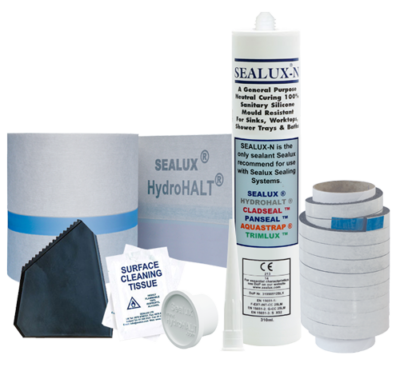 Sealux HydroHALT is supplied in kit format for one-off installers and also in trade roll format for professional ‘repeat’ installers. Sealux profiles incorporate sealant bond-breaking tapes on the inside face that allow the sealant to release under tension and stretch to accommodate the stresses created by joint expansion. 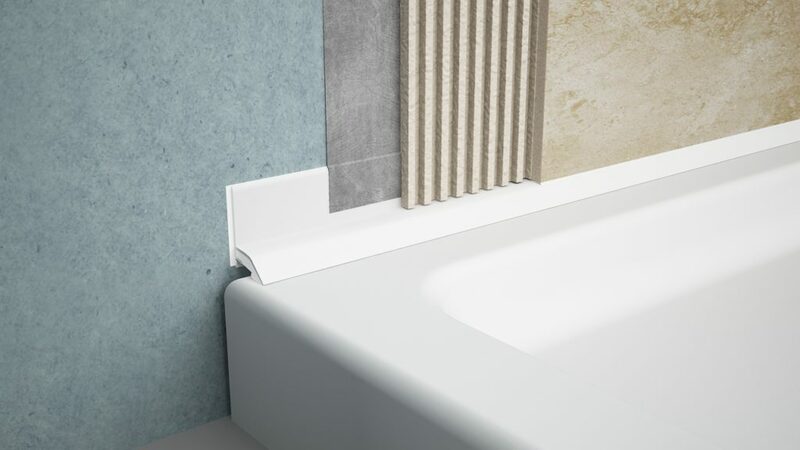 Sealux profiles can bridge wall ledge/gaps up to 12mm. 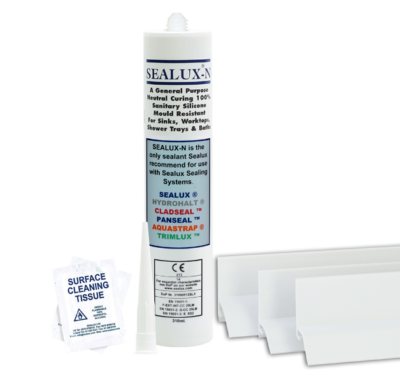 The sealant remains visually concealed and environmentally protected inside the Sealux profile. 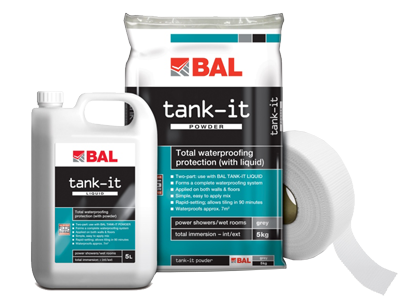 BAL Tank-it is rapid-setting two part waterproofing membrane that can be tiled over after only 90 minutes. BAL Tank-it facilitates same day ‘tank & tile’ installation without the need for priming or matting. Unlike BAL Tank-it, BAL WP1 is a single part waterproofing membrane that sets in 24 hours to create a flexible seamless moisture barrier between the behind the tiles and shower wall. 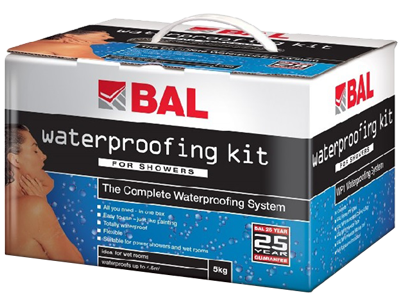 The BAL WP1 tanking kit includes BAL APD primer and polyester reinforcing fabric and supports a maximum weight of 32kg/m² on shower walls.